The nuclear force acts between all of the particles in the nucleus, i.e., between two neutrons, between two protons, and between a neutron and a proton. It is attractive in all cases. In contrast, an electrical force acts only between two protons and it is repulsive. The nuclear force is short-range: beyond a distance of a few times the typical nuclear dimension the force falls off to zero. 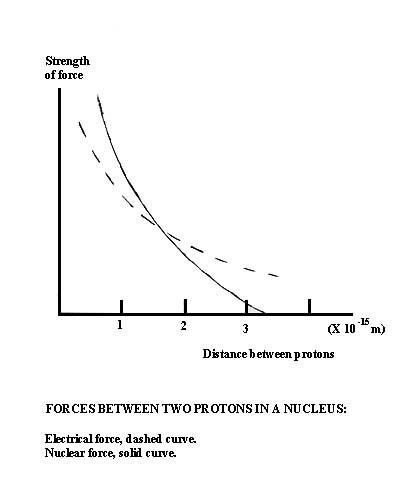 In contrast, the electric force decreases as two charged particles (protons) become farther apart, but it falls off inversely as the square of the distance, as gravity does. The electrical force does not become absolutely zero beyond a certain distance. Thus the nuclear force does not reach out into the region where the outer electrons are. It does not affect chemical processes or the physical properties of matter. There is no way to observe effects of the nuclear force in experiments done on a human scale, or even on the scale of atoms. The nuclear force only manifests itself in experiments done with nuclei - namely experiments on radioactivity and on nuclear reactions. But the nuclear force is crucial to the existence of matter as we know it. Without it there would be no nuclei, except for individual protons and neutrons. The neutrons would decay radioactively and disappear in a short time. The protons would become the nuclei of hydrogen atoms; so the only matter that would exist would be hydrogen. Force acts between any pair of nuclear particles (neutrons or protons). Force has short (finite) range.